Chinese stock market ETFs have not done well amid the trade war promulgated by President Trump. However, one Chinese internet ETF has turned in surprisingly solid performance. The key isn't just holding the biggest Chinese internet stocks, like Alibaba and Baidu, but less-well-known Chinese tech companies. China-focused equity ETFs generally have had a challenging time this year, with the country sitting in the middle of a trade spat with the U.S. and as economic momentum in the country wanes. Chinese stocks have taken a beating, and some market pundits are now saying they could be on the edge of a bear market that, once here, could linger for months. Contrast that to KWEB’s relatively bumpy-but-solid run this year, tallying gains of more than 7 percent, outperforming not only other major China equity ETFs but also the MSCI China IMI Information Tech Index — the benchmark we use for reference in this particular segment — by more than 6 percentage points, according to FactSet data. 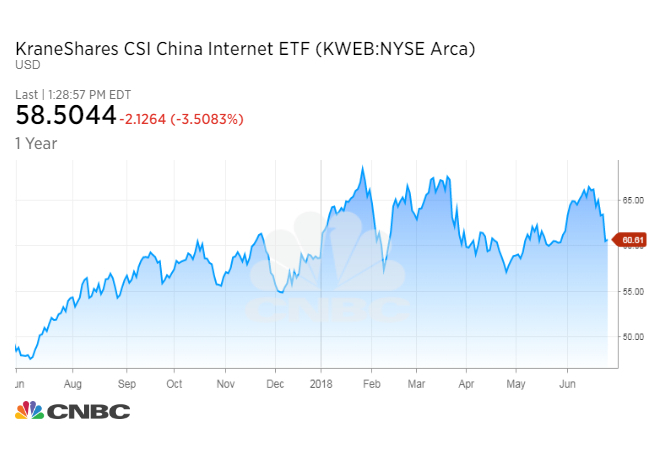 Notable here is that driving KWEB’s performance isn’t necessarily its big bet on the mightiest China internet names —companies like Alibaba, Baidu and Tencent. 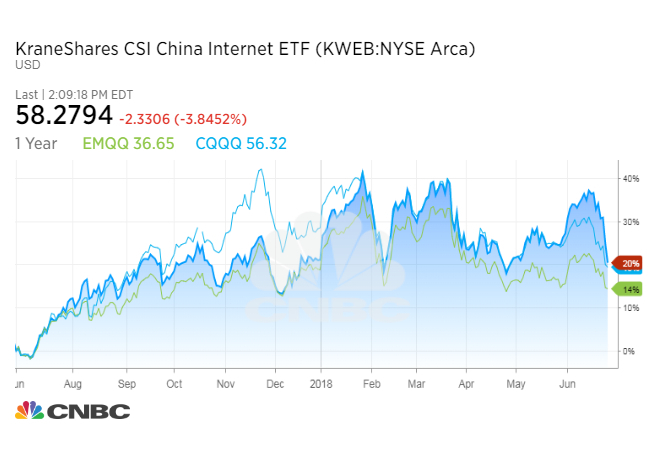 These companies are KWEB’s top holdings, and they have delivered a stellar run, but these three leading names in China’s tech segment have not been among KWEB’s top five best-performing stocks for the past three years. Powering the fund is allocation to companies like online video streaming iQiyi, which are making a difference. Since listing its N-shares in the United States in March, iQiyi has seen its share price triple, FactSet data show. Compared with giants like Alibaba, which has a market cap of about $516 billion, iQiyi is small potatoes, with market cap today of about $25 billion. “All of the outperformance can be attributed to stock selection in the software and IT services industry,” FactSet’s ETF analyst Scott Burley said — software and IT represent more than 70 percent of the portfolio. 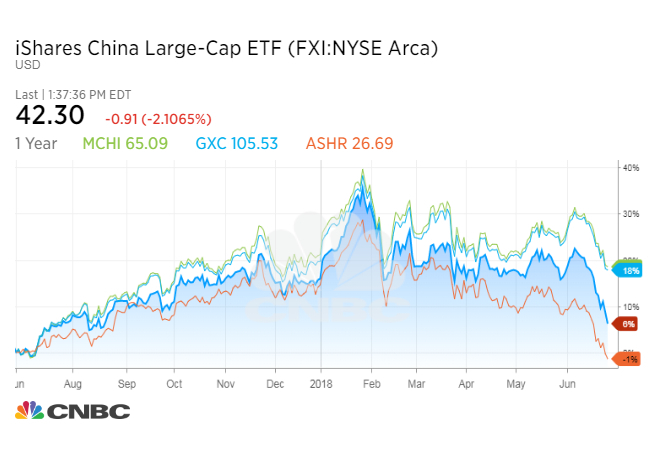 KWEB, which is nearing its fifth anniversary this August, is the third-largest Chinese equity ETF on the market, with $1.72 billion in total assets, behind only FXI and MCHI. It’s also KraneShares’ biggest ETF today, more than twice the size of the firm’s second-largest fund, the KraneShares Bosera MSCI China A Share ETF (KBA). KraneShares is known for its focus on China, with 6 out of its 10 ETFs on the market exclusively invested in Chinese stocks and bonds. KraneShares’ CEO Brendan Ahern clearly has skin in the China game, but we still asked him for his take on what’s making KWEB sing. His answer: the fund’s focus. “Chinese internet and e-commerce companies are in the sweet spot of China’s economy: domestic consumption; the service sector now comprises over half of China’s GDP,” Ahern said. About 20 percent of all retail sales in China today takes place online. That’s more than double the rate in the U.S., according to him. KWEB is not the only game in town for investors looking to access China’s tech story. Other strategies, such as the Invesco China Technology ETF (CQQQ) and the Emerging Markets Internet & Ecommerce ETF (EMQQ), also tap into some of China’s biggest tech names. The main difference is KWEB’s laser focus on internet stocks. It’s like they say: The bigger the risk, the bigger the (potential) return. So far, so good for KWEB.